I finally finished a sewing project...it's been a while, huh? Little Guy has outgrown most of his pajamas and bodysuits. He has several onesies, but they're mostly short sleeved which isn't really appropriate for this time of year without a cardigan. Ottobre to the rescue! 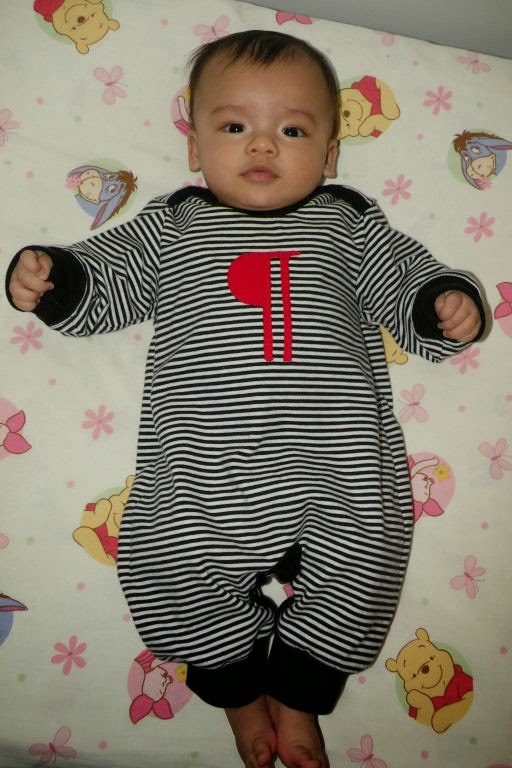 I had traced off the "Naava coverall" (Ottobre 6/2009, #3) but it was already a size too small. I "remedied" that by simply cutting it out a little larger all around and keeping my original seam allowance...a bit sloppy perhaps, but time-saving! I actually cut out two at the same time from the same material. I was going for practicality (something for the kid to wear!) rather than fashion. The other one is nearly done - just the leg binding and snaps left to do. Still, I needed to do something fun to spruce 'em up a bit. The other one was voted by hubby to be video game themed, so I decided to make this one reflect my abject nerdiness personality. Enter the pilcrow sign! Also known as the paragraph sign. I was originally thinking of a semi-colon or @ symbol, but after a quick perusal of Character Map the pilcrow won out. They turned out so nice! I used a soft jersey knit from Chez Ami and some rib knit that was given to me. So cute and snuggly to keep my Little Guy warm day and night! 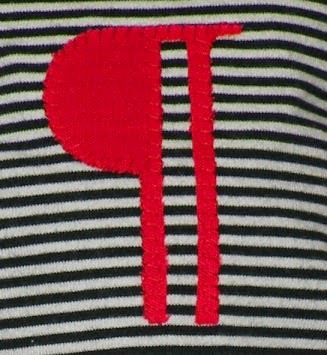 I love the pilcrow sign. I think I will have to incorporate some typography into what I do this year. Awesome idea. The clothes are almost as sweet looking as that precious little boy. Thanks! I'm tickled pink with how well they turned out...that and the chance to put my snap press to work! so cute and I LOVE that applique! "It makes me want to wag my tail"